A condensed version of an ideal personal folder structure. 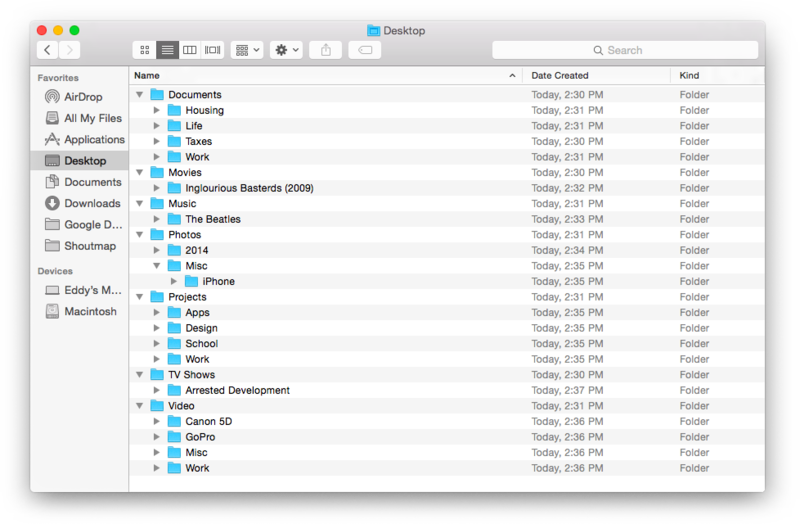 Building an organized folder structure, as dry as it sounds, can lead to you having complete control over your files. This is low priority to most, but once you start moving files around, it gets more and more exciting as you uncover old documents and photos from years forgotten. This can be a daunting task. You likely have files on old backup CDs and DVDs. Floppy disks even. But before you go about ripping all those physical mediums to your computer, let’s set up a solid foundation to put everything. Before we get too deep into the details, let me show you my root folders within Google Drive (which I’ll get to below). Now take a second to think about all your data. I would bet that most of your files include photos and video from your phone and camera, important documents related to taxes, receipts, and the like, any entertainment media that you consume, and any specific projects that you work on (for school, work, or yourself). Cool, easy, that all makes sense. Now let’s dive deeper into each of these folders to see what they contain! Housing - Copies of leases and utility bills. Spreadsheets of total home costs (including mortgage or rent, utilities, renovation expenses, internet and cable, and contact information). This folder will include any information about your current and previous residence. This comes in handy when you’re applying for a new apartment and you need the phone number of your landlord from two leases ago. Life - This vague folder contains documents that directly relate to you as a person. This might include health documents like immunization records, personal notes about yourself or family, and copies of Christmas card letters from each year. Taxes - Within this useful folder lives all of your tax information, broken down into folders by year. This is where you’ll save receipts for charity donations, Turbotax files, and receipts for write-offs. Work - With the immediacy and ease of use that the internet provides, you’ll likely have been shared a handful of Google Docs that your company uses to brainstorm on in real-time. This is a great place to throw all those docs. Depending on your line of work, you may make a project folder within here for each project. If you have a collection of movie files, this is where they go. I recommend putting each movie into its own folder since many movies come with a subtitle track or bonus features. Just like Movies, but it contains your music! Brilliant. In here will be folders for all the artists that you have music from. Within each artist will live the album folders. And within there, the music files themselves (hopefully in 320kbps!). Consider this folder as a shelf full of yearbooks. So as your might guess, you’ll have one folder in here per year you’ve taken a photo. You could, in theory, have all your photo folders arranged in this folder with the naming convention <year>-<month>-<day>-<description>, but that would get really full really quickly. You want to break things down by year so you can quickly find, say, your Christmas photos from 2007, because they’ll be near the end of the list in the Photos > 2007 folder. In this Photos folder I also have a Misc folder for more random photos that weren’t taken with my camera. This includes iPhone, Photobooth, People, and Shiny (portfolio-worthy photos and 3D renders). This acts as a catch-all for clusters of files that are closely related, but not necessarily the same kinds of files. If you’re working on an app, for instance, you would make a folder in here that contains all your asset files, code files, images, press kits, and so on. If you have multiple types of projects, you should break them down into category folders like: 3D, Apps, Design, School, and Work. For some, this folder and the Photos folder could live together, but if you take a lot of video with a dedicated video camera or SLR, you might want to separate it from the slew of photo folders you’ll likely have. For now, I have all my videos arranged in folders by the camera it was filmed on or the purpose for the video: Blackmagic, Canon 5D, GoPro, Work, Misc. Within each of these are dated folders for each shoot. Or for Work, arranged by project. So there you have it. There’s a look at the foundation of a clean and solid folder structure. Sure, there are tons of other root folders you can make (Programs, Assets [to store fonts, stock video, templates], or Company [for employee records, business cards, website assets]). In a later post, I’ll dive into a more technical folder structure for businesses, with a focus on design and video production. “But wait, Eddy,” you might say, “where do I put all those folders? On my desktop? !” Oh please no no no. Your desktop should be treated like a real desk top. You wouldn’t store all of your belongings on it now, would you? Hopefully not. There are two steps that I recommend you take while pushing and pulling all this data. First, find a clean block of hard drive space that you can start working in. If your computer has enough hard drive space, that’s great! If not, you can do what I did and pick up a 2TB portable hard drive. This is doubly useful as it will act as a physical backup for all your files. I highly recommend the Western Digital My Passport Ultra. It’s USB 3.0 for fast transfers and doesn’t require an external power source. And it’s tiny! This thing can fit in your pocket if you were so inclined. Once you have this free block of storage, build out your folders. You want to have your files come over the wire and land right where they belong. Now here comes the time-consuming part. You have to go through all of your devices, memory cards, CDs, DVDs, phones, and everything in-between to gather up everything. It is very beneficial to get everything; it's daunting, yes, but once you’re confident that all your data is in one place, you’ll have a new level of peace of mind. You never know when that scratched CD of all your high school graduation photos is going to kick the bucket. Those things don’t last forever. When you start really getting into the thick of it, you’ll find your folder structure evolving with your content. A business owner is going to have a very different foundation than a musician or astronaut. As long as you think ahead while creating new folders, you should be fine. Great, now you have your life’s worth of 01010001010101010 in one place. Congratulations! But we’re not in the clear just yet. If that hard drive failed tomorrow, all would be for naught. So now we move on to our final step! (until we get into file size management down the road). The Cloud! For those of you who don’t understand entirely what the ‘cloud’ is, it’s simple. It’s just the term to describe hard drives that store the data they get from the internet. The benefit of this is that they are redundant (meaning that your files are duplicated at many different servers geographically) and you can access them from anywhere. From my phone, I can view every photo I’ve ever taken. I don’t need a portable hard drive or computer even! It’s truly astonishing how far technology has come. So we this, we start our journey to the cloud. Both Google Drive and Dropbox do similar things. You install the little app and it plops a folder onto your computer. As you copy files to this folder, it syncs it up with those hard drives scattered around the world. And boom! There you go. I’ll walk you through the Google Drive setup, as that’s what I recommend. Google Drive has the advantage of having Google Docs, which allows you to create unlimited number of text documents, spreadsheets, presentations, and more. One caveat is that you need a Google account to get started. These are free and come with an overwhelming number of features and benefits. You can do so here. Once you get your Google account setup, you’re ready to install Google Drive! The great thing is, you can start for free with 15GB. That’s enough space to get your folders set up and to start copying your smaller documents and projects. Your photos and videos will likely be much too large to fit there. If you’re willing to scale all your images down to below 2048px though, you can upload them all to Google+ for free, but I would recommend sticking to the folder structure that you’re in control of. Now you’ll find yourself quickly approaching that 15GB limit. If you’re liking the service, you can upgrade to 100GB for just two dollars per month or a whopping terabyte for just ten bucks a month (the plan that I’m currently using)! You may be hesitant to sign up for yet another monthly subscription, but if you’re using the terabyte size, it comes out to $120 per year - that’s right around the price of buying another hard drive to store a copy of all your files. If you care about the longevity of your files, this is the way to go. Hooray! Just like that, you’ve managed to take control of all the digital clutter that you’ve amassed over the years. Now I’m sure you’ve got the itch to go in there and start trimming the fat. My initial backup was over 500GB, but I’ve managed to cut it down to 250GB without losing anything valuable. But more on that later.